Leading Manufacturer of polyurethane tubings in straight & coil form, high pressure nylon tubings and retractable nylon coiled hoses from Nagpur. We introduce ourselves as a prominent manufacturer & supplier of Polyurethane Tubings in Straight & Coil Form. The offered product is developed with the help of top quality material and modular techniques in compliance with set industry standards. This product is made obtainable in number of specifications for our customers to choose from. Clients can avail this product from us at nominal price in a stipulated time. By keeping track of the latest market developments, we are offering High Pressure Nylon Tubings. Our offered product is used in compressed air lines on the pneumatic control systems. This product is manufactured under the visionary guidance of experts utilizing finest grade material and latest techniques in conformity with set industry norms. Besides, offered product is properly checked on different quality parameters assuring its excellence at customer’s end. In fuel lines for diesel fuel or petrol in the Automobile and Transport Industry. Compressed air lines on the pneumatic control systems. High pressure lubricating oil lines in the Engineering and Automobile Industry. Lubes and air lines on the textile machinery. Transporting lines for alimentary liquids like milk and beer as well as biological liquids including blood and serum. 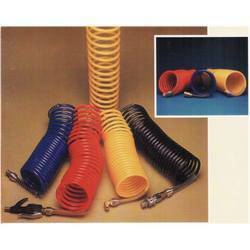 With sincerity and hard work of our professionals, we have carved a niche for ourselves in this domain by offering Retractable Nylon Coiled Hoses. This product is available in different specifications as per the needs of customers. Our offered product is valued in the market for its fine finish. The offered product is manufactured under the supervision of experts utilizing superb quality material and advanced tools in adherence with prevailing market trends. HOSE I.D., 4mm to 12mm. 5/32" to W.
Natural, Red, Yellow, Green, Black, Blue, Orange. 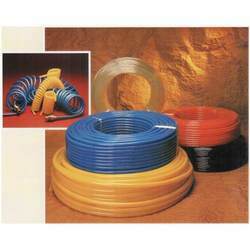 HASOLON Retractable Nylon Coiled Hoses find applications where air sanders, air hoist, blow guns, drills, moving cylinders, nailers, nut runners, clippers, staplers, riveters, paint sprayers, screw drivers hoists, heavy duty tools and other pneumatic tools are used on overhead assembly lines. Hoses are available with different types of fittings such as Drive-in-Compression, swivel and quick release coup­ling and spring guards to suit various applications. 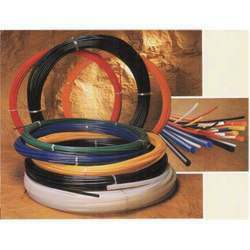 Looking for Polyurethane Tubing ? Food, Dairy, Bottling Industry Products.